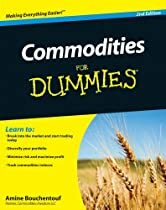 Get more bang for your buck in the commodities market and start trading today While Wall Street has been troubled, commodity markets have been soaring. Since 2002, commodities have outperformed every other asset class including stocks, mutual funds, and real estate. This hands-on, friendly guide gives you the basics on breaking into the market, dispels common myths, and shows you how to implement a wide range of trading and investing strategies. It also helps you diversify your portfolio, measure risk, and apply market analysis techniques.